Using recent advances in machine learning, a team of scientists led by Saeed Hassanpour, PhD, assistant professor of biomedical data science at Dartmouth Geisel School of Medicine, developed a deep neural network to classify different types of lung adenocarcinoma on histopathology slides, and found that the model performed on par with three practicing pathologists. Currently, lung adenocarcinoma requires pathologist’s visual examination of lobectomy slides to determine the tumor patterns and subtypes. This classification has an important role in prognosis and determination of treatment for lung cancer, but it is a difficult and subjective task, according to Hassanpour. 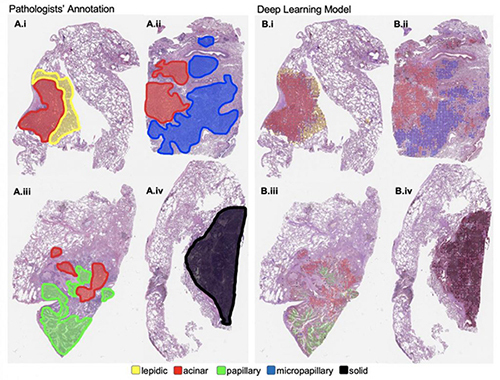 Using recent advances in machine learning, the scientists, led by Hassanpour, developed a deep neural network to classify different types of lung adenocarcinoma on histopathology slides, and found that the model performed on par with three practicing pathologists. The team’s conclusions (“Pathologist-level classification of histologic patterns on resected lung adenocarcinoma slides with deep neural networks”) are published in Scientific Reports. Recognizing that the approach is potentially applicable to other histopathology image analysis tasks, Hassanpour’s team made their code publicly available to promote new research and collaborations in this domain.